If you are a generator of biohazardous waste, you are responsible for ensuring that you and your employees follow regulatory requirements and University guidelines concerning management and disposal of biohazardous waste within your laboratory, shop or work area. The following list of steps outlines the procedures and information needed to comply with the University’s rules on managing biohazardous wastes. They are presented to give you a better understanding of how to manage those wastes and help assure their safe disposal. A detailed description of each step can be found by following the appropriate link. Questions about hazardous waste management at BSU should be directed to Dale Dreyer at 755-2780. Step 2: Identify biohazardous wastes. Step 3: Segregate and collect wastes in sturdy, leak-proof containers. Step 4: Contact Dale Dreyer to have waste containers removed by calling 755-2780. The management plan must be updated at least once every two years. Please refer to Minnesota statute section 116.79 for a complete description of what must be included in the plan. Provide a training and information program for affected employees. EHS has developed an Exposure Control Plan that covers the University’s general operations. However, departments must supplement that with a written plan that is specific to their activities. The BSU Exposure Control Plan is available by contacting EHS. Generators of infectious waste must comply with applicable provisions of the Minnesota Employee Right-to-Know standard. Under the standard, employees who handle infectious agents must be provided information and training as described in part 5206.0700 of the standard. The federal OSHA Bloodborne Pathogen standard contains similar requirements. The Minnesota Right-to-Know standard acknowledges that fact and accepts compliance with the Bloodborne Pathogen standard as meeting the requirements for infectious agents required by the Right-to-Know standard. 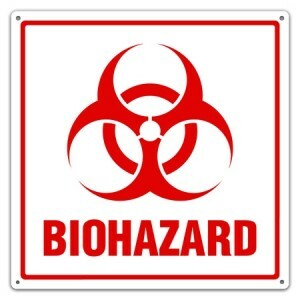 Biohazardous waste is all biologically contaminated waste that could potentially cause infection in humans, domestic or wild animals or plants. Examples include human blood and certain human body fluids, recombinant DNA, human, animal or plant pathogens, cultures and stock of infectious agents, any discarded preparations made from genetically altered living organisms and their products, and contaminated sharps. The material is caked with dried blood or other potentially infectious materials and is capable of releasing these materials during handling. BSU employees are not expected or encouraged to compress wastes or use any other method, other than visual observation, to determine if a blood contaminated waste should be disposed of as a biohazardous waste. If you are unsure if a blood contaminated waste meets the criteria for regulated waste, assume that it does or contact EHS for assistance. Also please note that feminine hygiene products are not considered regulated wastes. Sharps include discarded articles that may cause punctures or cuts, including, but not limited to, all used and discarded hypodermic needles and syringes, Pasteur pipettes, broken glassware, scalpel blades, and disposable razors. All sharps, including uncontaminated ones, need to be disposed of in leak-proof, rigid, puncture resistant, shatterproof containers that are labeled or color coded red. DO NOT PUT ANY SHARPS WASTE IN REGULAR TRASH OR DUMPSTERS. More information on the proper disposal of sharps and other biohazardous waste can be found by reviewing Step 3 of the biohazardous waste procedures. Information on biohazardous waste handling and pick-up procedures can be found in the Biohazardous Waste Disposal Table, PDF. All biohazardous waste must be segregated from regular trash. Place non-sharps in red, plastic biohazardous bags. The bags must either be red or, if of another color, bear the universal biohazard symbol. Waste that is to be autoclaved must be in bags designed for that purpose. In addition, autoclave tape or some other visual indicator must be used, to verify the waste has been autoclaved. Biohazard bags are available from BSU Central Receiving. The biohazard label on a waste bag or use of a red bag signifies that items inside pose an exposure risk. These containers require careful handling. Never discard needles, syringes, blades, or other sharp objects directly into waste bags because of the high puncture risk. Instead, place them in a puncture-resistant, leak-proof sharps container that is labeled or color-coded red by the supplier. Use a sharps container for all sharp items, even those free of contamination. Never reach inside, and be sure to replace containers when about three-fourths full. Overfilling containers is hazardous. Sharps containers are available from suppliers of medical equipment and materials, drug stores, and safety equipment suppliers. DO NOT RE-USE SHARPS WASTE CONTAINERS. Dale Dreyer will pick up biohazardous waste containers and arrange for disposal through an outside contractor. Contact Dale Dreyer at 755-2780.